Patterns and Predicability with NGSS - Space Systems Standard 1st Gr. The lens of our space systems is such a fun way to explain the patterns and predictability found in nature. The shift to NGSS standards for science has me very happy. I like that 1st grade kiddos aren’t overloaded with a bunch of concepts. The few standards offer plenty of opportunity to delve deep and gain a firm mastery over the concepts. The space systems based standards are clear and the kiddos enjoy them. ESS1.1 – Use observations of the sun, moon and stars to describe patterns that can be predicted. ESS1.2 – Make observations at different times of the year to relate to the amount of daylight to specific times of year. 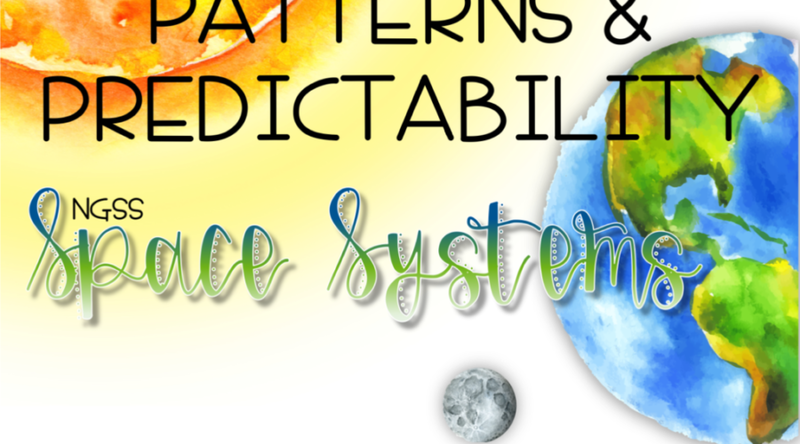 The Patterns and Predictability with Space Systems resource is loaded with lessons, activities and resources that help students grasp the concepts, not only in regard to nature and it’s love for cycles and patterns, but of simply how our space system (Earth, the sun and moon) work together. Each lesson is clear and detailed. These space systems lessons also include engaging, but simple to do, activities which promote a more thorough understanding of each topic. When cookies are part of your learning, it’s a fun day! I love using posters in class. I often use completed ones to open discussions or as reference during an activity or writing assignment. Posters are also great inspirations for student/lesson-driven anchor charts. Just start with a blank piece of chart paper. Add in some basic images. Then during a lesson, have the students help complete the chart with responses to questions or a “brain dump” (tell me everything you know about . . .) activity. Because I want to be sure we our using our reading skills ALL.DAY.LONG, one of my favorite resources is interactive readers. These space systems readers are no exception. Using interactive readers ensures the kiddos are engaged and participating. The readers are super easy to prep, come with a word bank and include graphics that are a lot of fun to color. Most importantly, they exemplify the lesson and provide the kiddos with concrete examples and an opportunity to share what they’ve learned. The paper and pencil activities are simple and direct. Each lesson includes an activity with which the students incorporate their new learning. Using all of the technology available to us, there are many sites (links included) we can visit to get accurate data so these activities can all be done quickly in class. There is no need for junior to stay up past his bedtime and rise with the sun just to track the patterns and predictability of the sunset and sunrise, nor the current phase of the moon. My kiddos LOVE games. I always have a few card games available. I like putting these activities out for word work (even though they are all about science). They provide a fabulous avenue for NGSS mastery and ELA skill building! Included are several different game instructions for these cards. All of the games are simple and can be done independently in small groups. As I’ve discussed before, I keep a theme running in my room for about a month. Each theme is based on either a social studies or science standard. I also keep vocabulary words about that theme on my focus wall. The kiddos use those words in discussions, when writing, and as a resource when working independently. 15 vocabulary cards included in the Space Systems unit. Use any of the components of this resource as an assessment. This resource also includes a formal assessment and its answer key. The assessment is quick and easy to grade. Win-Win! This resource has everything you need to cover those important NGSS Earth Science standards using our space systems to demonstrate patterns and predictability found in nature. You can find it in my store!